Queensland Police will trial new high-tech cameras that will provide video and audio records of incidents on the road, from high-speed chases to roadside traffic stops. The new camera system would be fitted to just one police car as it patrols various postings within the south east region and further afield in the state. “We see this as being very effective in traffic management and traffic enforcement and we have a very large fleet of traffic vehicles,” Deputy Commissioner Ian Stewart said. Police would have the option of triggering the camera system manually, while the system would automatically activate under certain circumstances, like when the siren was activated, the horn was used, when the car suddenly accelerated or braked, or when the vehicle was bumped or hit. “When recording commences, either manually or automatically the previous 30 seconds is stored along with the current data, the camera and audio will be running at all times,” Mr Stewart said. “It then keeps running until it is turned off, with some automatic time-outs, but there will be the ability to turn the camera off. 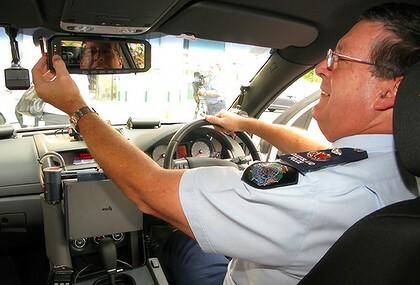 While Police could not estimate a cost for the system, a similar system in New South Wales cost $8.6 million to roll out across 340 highway patrol cars in 2004. “I am not aware of the current cost of the technology but as this is a trial there would be a great different between a one off purchase and if we were to roll it out,” Mr Stewart said. While the Queensland Police Union recently called for police to be equipped with button hole cameras and microphones, Mr Stewart said both types of recording equipment would be considered. “The in car camera equipment is a far different proposition and is used for significantly different purposes than the button hole cameras, we see them as complementary technologies, not exclusive, so potentially we could be using both,” he said. Mr Stewart said the cameras would not just make life easier of Queensland Police but would also reduce strain on the courts. “The benefit to the community will be if we are able to prove a case through the use of this kind of evidence then the cost of any court hearing is reduced.” he said. The trial will run for five months.